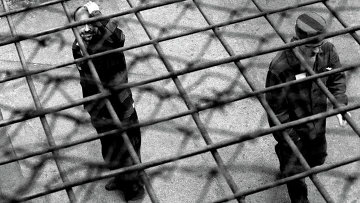 Russian prison officers receive jail terms for beating inmate | Russian Legal Information Agency (RAPSI). MOSCOW, November 15 (RAPSI) – Four officers of a penal colony in Chelyabinsk Region have been sentenced to prison terms ranging from 3 to 8 years in prison for beating an inmate, the victim party’s lawyer Andrey Lepekhin has told RAPSI. According to the attorney, Alexander Dontsov, Victor Podkorytov, Viktor Zavialov and Vladimir Malinin have been found guilty of abuse of power with the use of force resulted in heavy consequences. It was found by court and investigators that on December 21, 2015, Dontsov hit convicted Sultan Israilov because of personal enmity; the prisoner fell and pitched on his head. Later, Dontsov and Malinin ordered a punitive confinement’s duty officer to give them a rubber truncheon, handcuffs and a key to the cell, and to leave the unit. According to case papers, they handcuffed Israilov and beat him, then they tightened a scarf around his neck, tied to a metal window lattice and filed out. These actions led to the inmate’s death. 16:18 15/11/2018 Four officers of a penal colony in Chelyabinsk Region have been sentenced to prison terms ranging from 3 to 8 years in prison for beating an inmate.